SSERVI’s Dr. David Morrison has just published a biographical memoir of Carl Sagan. Dr. Morrison’s eloquent memoir reflects upon the early years of Sagan’s life, his polarizing influence at Harvard and “out of the box” thinking that made him a campus star at Cornell, his rise as a science communicator, his many scientific contributions to planetary science, and more! It is a must read for any Carl Sagan fan. Carl Edward Sagan was a founder of the modern disciplines of planetary science and exobiology (which studies the potential habitability of extraterrestrial environments for living things), and he was a brilliant educator who was able to inspire public interest in science. A visionary and a committed defender of rational scientific thinking, he transcended the usual categories of academia to become one of the world’s best-known scientists and a true celebrity. Sagan was propelled in his careers by a wealth of talent, a large share of good luck, and an intensely focused drive to succeed. His lifelong quests were to understand our planetary system, to search for life beyond Earth, and to communicate the thrill of scientific discovery to others. As an adviser to the National Aeronautics and Space Administration (NASA) and a member of the science teams for the Mariner, Viking, Voyager, and Galileo missions, he was a major player in the scientific exploration of the solar system. He was also a highly popular teacher, but his influence reached far beyond the classroom through his vivid popular writing and his mastery of the medium of television. 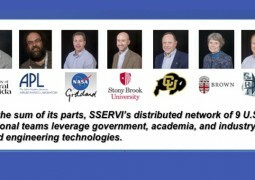 Selected research highlights from each SSERVI team presented during the 2016 ESF.